Bill Fletcher was born in Fullerton California on October 9, 1949. He graduated from the University of San Diego School of Law in 1975. He was sworn in to practice law in December 1975 and started his own law practice in Encinitas. In 1977 Bill was hired by Defender’s Inc. and immediately placed in the North County office in Oceanside. Around 1979, when the County switched to the contract system for indigent defense in San Diego, Bill along with the now Honorable Susan Finley and Pierre Pieffer were awarded the first contract for downtown San Diego. After spending nearly, a year with Sue and Pierre, Bill was persuaded to return to Oceanside and work the North County indigent defense contract with Frank Baker, Brad Patton and Jeff Riley. Bill quickly established himself as a premiere trial attorney. In 1983 Bill went on the Board of Directors for the Defenders Program of San Diego, Inc. where he served until 1991. Bill was President of the Board between 1989 and 1990. In 1988 Bill was declared the Criminal Defense Attorney of the year by the Criminal Defense Bar Association in part for his excellent work on the highly publicized Troiani murder case. The client Bill was co-representing was eventually acquitted. Bill again received the award as the Criminal Defense Attorney of the year in 2004 in part for his work on the Richard Tuite murder case. Bill had been a long-time member of the Criminal Defense Lawyers Club and was the President of the Club in 1997. He was also on the Board of Directors for California Attorney’s Criminal Justice. For many years Bill was an author of Chapter 4 of the California Criminal Law and Procedure manual produced by CEB. 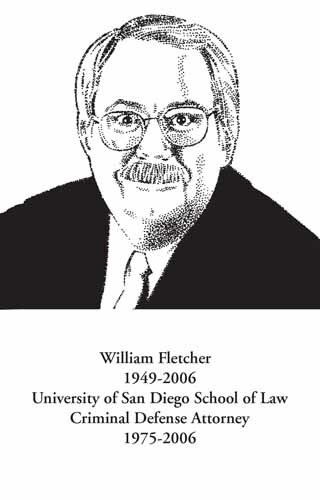 In short Bill Fletcher was a preeminent attorney and a Certified Criminal Law Specialist whose criminal defense practice covered the State, Federal and Juvenile courts. Bill died of complications related to Leukemia in March 2006 at the age of 56.